As soon as anyone over 16 walks into the Seymour Art Gallery, they feel like a kid again, surrounded by bright whimsical fairies and wicked dragons. The kid-friendly Start with Art show is back for its 13th year of helping kids build art collections with works by celebrated Canadian artists. 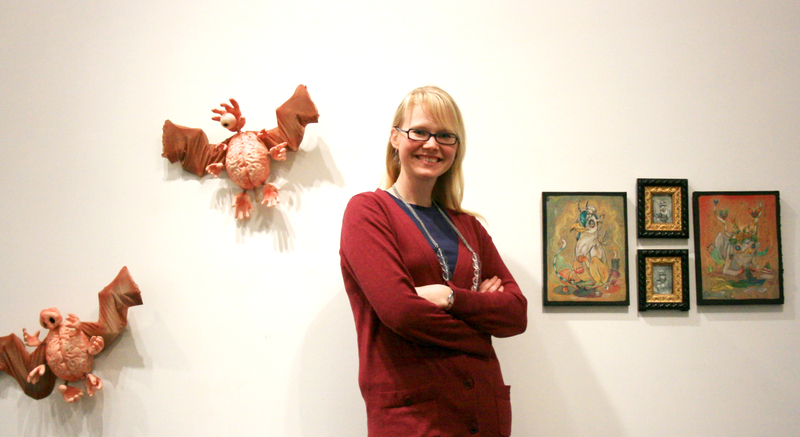 Sarah Cavanaugh, curator at the Seymour Art Gallery believes building an art collection as a child is an enriching experience. Highlighting 16 artists this year, the show brings everything from traditional paintings to felt dolls and creepy mechanical brains with bat wings. Start with Art teaches kids about art and gallery culture, while pricing all the works under $150 so kids can afford it. Better than a deck of hockey cards, building an art collection from a young age helps kids appreciate the works of art they pick. “To choose something and then live with it, it’s an amazing gift,” said Cavanaugh. With all the art at a lower height for kid-friendly viewing, boys and girls can tromp through the show and purchase art, as only those who are under 16 are allowed to buy anything. Kids also get to put the red dot signifying ‘sold’ next to their work, teaching them more about how galleries operate. “It sort of takes out that lag,” said Cavanaugh, of the time in early adulthood when we often can’t afford to or don’t choose to purchase our own art. This way, says Cavanaugh, when a child goes off to college they can hang art by respected artists on the walls instead of simply posters. The show runs until May 4 and with about 3,000 people coming through, including several elementary school groups, the Seymour Art Gallery is sure to be abuzz. During the North Shore Arts Crawl, the gallery will be holding a free puppet show for kids. Initially written for the North Shore Outlook newspaper, April 11 2013. In print and online.